Even people who don’t pray, pray on Thanksgiving. We all thank God for family, friends, health, prosperity, and whatever else brings us joy, comfort, and companionship — which we almost always call “blessings.” I love hearing all of those prayers of thanksgiving, because I believe that gratitude is a primary attitude of faith. But I have been wondering this weekend if we are forgetting something — confession. What if our Thanksgiving prayers included our admitting that we have ignored, declined, wasted, or misused many of the blessings that have arrived in our lives? If we believe that God is the source of everything, then we owe God an apology for our squandering of so many opportunities to enrich our own lives, the lives of our neighbors, and the health of the world. So next November, let’s consider offering words of confession before we turn to our words of gratitude. In fact, let’s consider doing that every time we offer thanks. 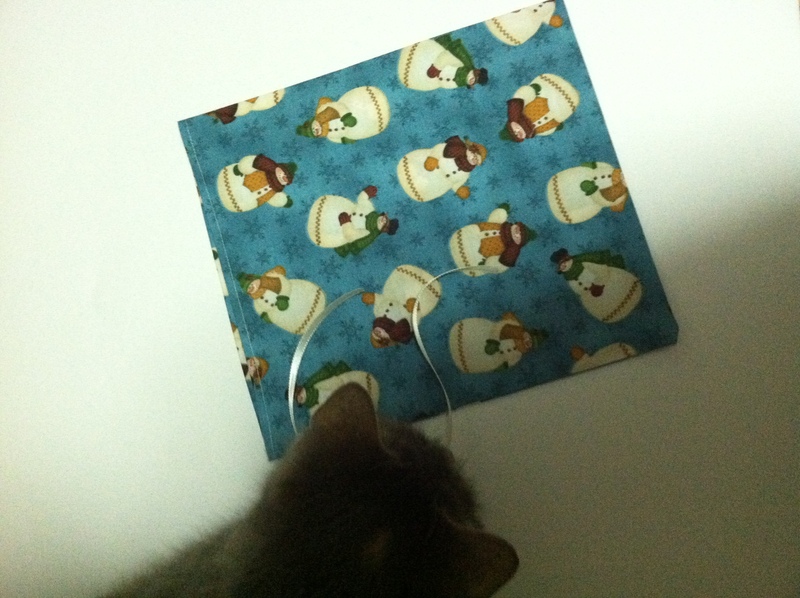 I’m also making bunches of these eco-friendly gift bags. We’ve used them for years in our family — they are no more expensive than wrapping paper (especially if you watch for sales on Christmas fabrics), and you can use them again and again. 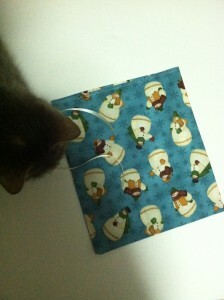 An added plus: Itty-bits (the cat) thinks the ribbons are great kitty toys! 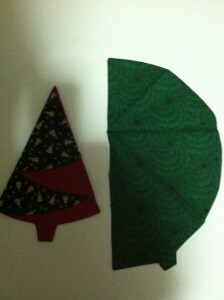 I’m having fun this weekend, sewing madly to make items for my church’s Holiday Marketplace next weekend. 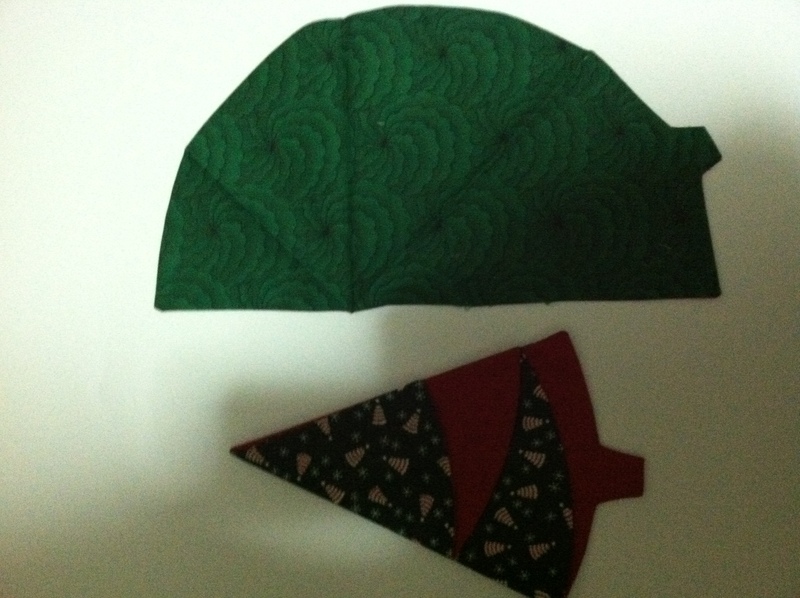 This great napkin is a half circle (with a little stem thing) that folds up to look like a Christmas tree. I told a friend that I was making them, and she ordered 12, sight-unseen. Gosh, I better get back to the sewing machine! BTW, the Holiday Marketplace is December 1 & 2 at First Congregational Church of Minnesota, UCC. Hope to see you there! PS: Part of the proceeds from all the artists and craftspeople will be donated to charities. I am going to donate through the church to Avenues, a place for homeless GLBT youth in Minneapolis. As I have watched the political campaigns this year I am amazed and grateful for the women and men who are willing to submit themselves to scrutiny, criticism, invasion of privacy, misinterpretation, and various forms of “spin” in order to become public servants. I want to offer a prayer of thanksgiving and hope for these fellow citizens. (Parts of this prayer were offered in the Minnesota House of Representatives in January, 2009). the blessing of loyalty in representing their constituencies, along with the blessing of courage in sometimes challenging their views.